Empower Illinois is Chicago’s largest scholarship granting organization. 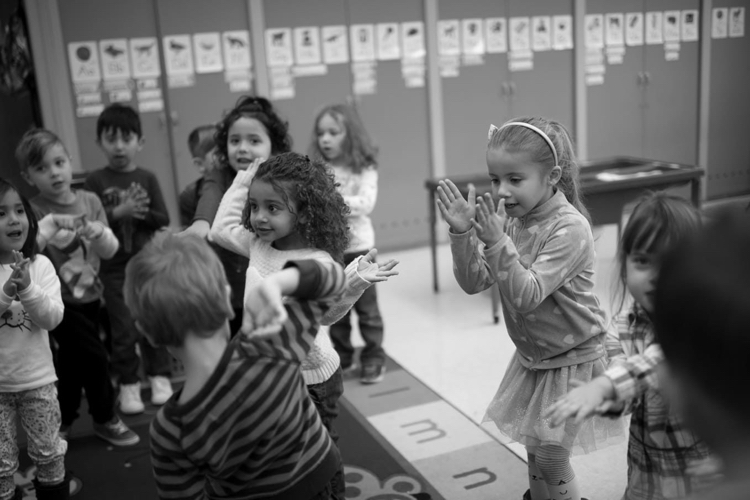 It’s mission is to expand quality education options for low-income and working-class families of Illinois. Empower expects to provide close to 15,000 private school scholarships a year to underprivileged youth according to their website. With the program starting in 2017, Empower had a short amount of time to set up its operations. It needed to work quickly to get its technical infrastructure up and running. Empower needed a website explaining the program, an online process for handling donations, and a system to accept tens of thousands of scholarship applications. Empower needed to provide a trusted source of information to families about the program and available scholarships. 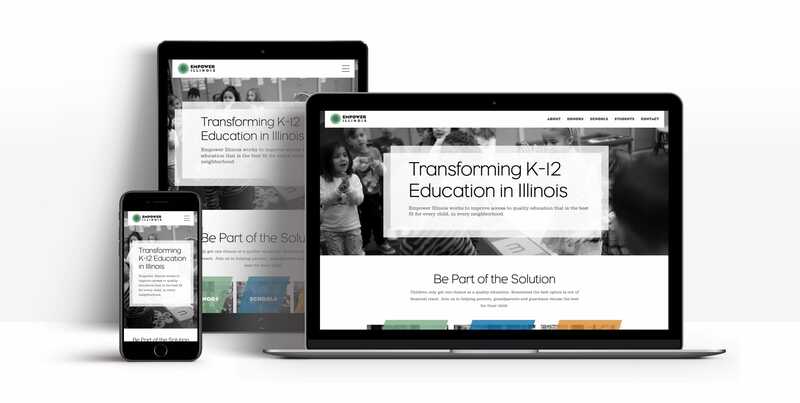 Empower also wanted to use technology to make it more efficient and help it comply with Illinois’ requirements under the Invest in Kids Act. To facilitate donations to their organization they had a simple webpage that directed donors to a wide array of forms and steps that was often confusing and detracted from the donation process. 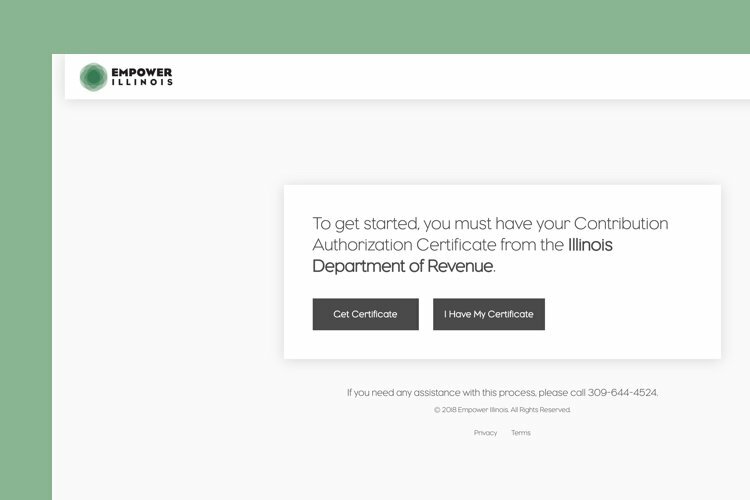 They wanted a web application to replace this mostly manual system in order to provide an organized clean user experience that would be easily conformable to Illinois Department of Revenue requirements. The application takes ownership of this process, directing users to the appropriate channels and making donation collection straightforward. During our discovery workshop, we worked with Empower to fully understand the donation and application process under the new Illinois law. The program had many detailed requirements that had to be accounted for. Getting to see the nuances of how donations flowed between the Illinois Department of Revenue, Empower Illinois, and eventually to funding scholarships, highlighted just how complicated the process could be. We immediately recognized that we needed to simplify the process. We realized that in addition to an informative website, Empower needed an efficient way to accept donations online. 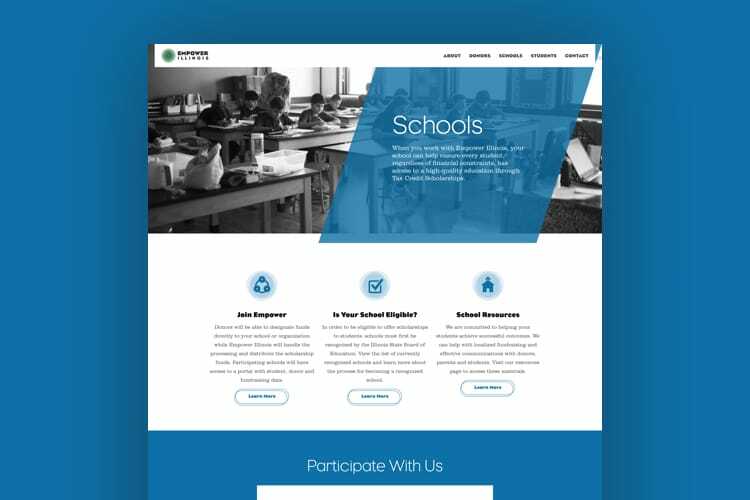 We started by creating initial layouts for Empower’s website that would be both flexible yet tailored to their content. With a mission centered around children and their education, we made sure to include plenty of imagery of kids in the classroom. To visually differentiate the donor, school, and student; we assigned each of them a different color and themed the pages accordingly. Additionally we drew inspiration from the logo, using the patterns, icons, and overlapping elements for both consistency and visual interest. 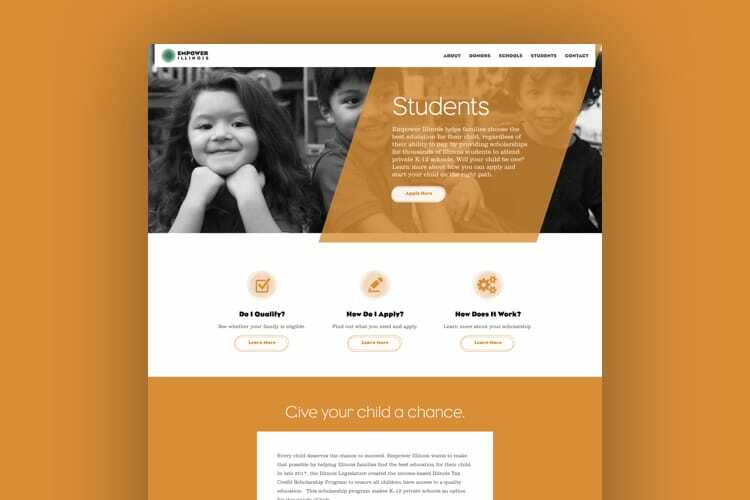 In addition to designing the website, we evaluated and organized every step in the donation process noting where we could save users time, eliminate confusion, and collect the most pertinent information. From there we outlined a flow of a stepped donation wizard to break apart the long complex process in a way that would keep donors engaged. The wizard would guide donors through the process, ensuring they were directing funds correctly. 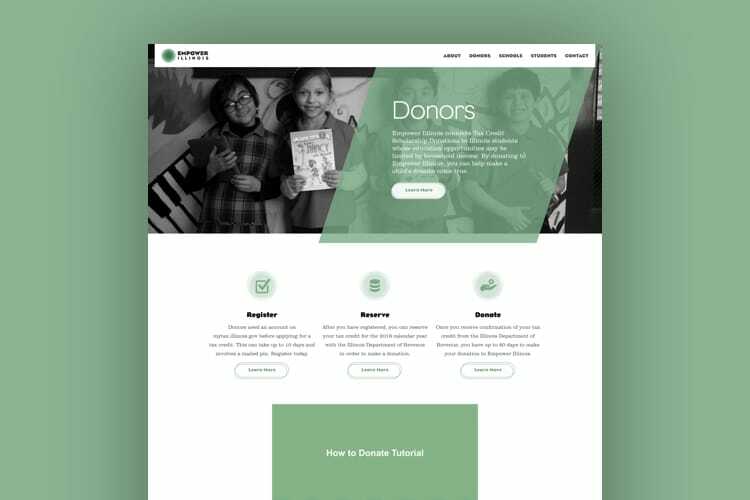 Finally we carried over many of the design components used on Empower’s website to create a consistent feel from the website through making online donations. Empower’s donation process was a huge success. The organization has raised almost $30 million dollars in its first year. By leading the way in program information and creating a streamlined process, Empower has collected 80% of all donations under the state’s program. Learn more about how we help Education Firms.